The confirmation of Supreme Court Justice Brett Kavanaugh has leftists up in knots. Now one Hollywood liberal’s rage against Kavanaugh got her in hot water. The Democrats have become insane. Donald Trump’s victory destroyed them. After eight years of Barack Obama, they thought they would get eight more years of Hillary Clinton. Obama’s recklessness followed by Clinton’s corruption would’ve done grave damage to the country. But the American people were sick of it. But the Democrats and the media refuse to believe it. This identity crisis among Democrats left the party open to turmoil. Now the Democratic Party is controlled by the far left. Socialists like Bernie Sanders and Alexandria Ocasio-Cortez are now the face of the party. And in order to maintain relevance, the moderate left is barely distinguishable from the hard left. Hawaii Senator Mazie Hirono showed that with her extreme talk during the Kavanaugh proceedings. This is the battle cry of radical feminists intent on destroying men. Hirono wouldn’t even rule out that the Democrats might try to impeach Kavanaugh. The insanity of the left of course exists in Hollywood. After decades of effort, the left runs the entertainment industry. These leftists move in lockstep with the Democratic Party. They push their messages in movies, TV shows, songs, and every other form of media content. Right now celebrities are using their fame more than ever to attack Trump. Many celebrities were afflicted with peak Trump Derangement Syndrome during the Kavanaugh hearings. Their rage led to riots and countless smear articles from dishonest media. 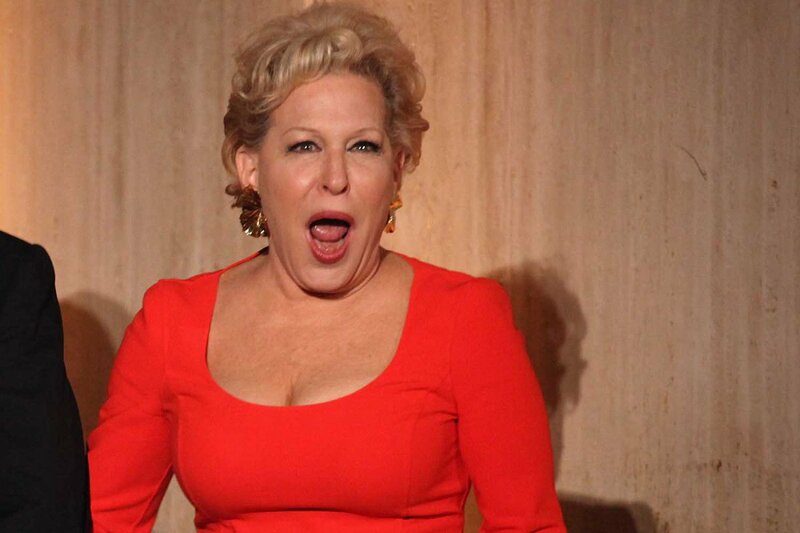 All-around performer Bette Midler is a prime example of this Hollywood hatred. Midler attacked Trump on a host of issues in the past. Midler’s hatred of Trump caused her to lose it. Midler’s defense was she was quoting Yoko Ono, but it predictably went terribly. 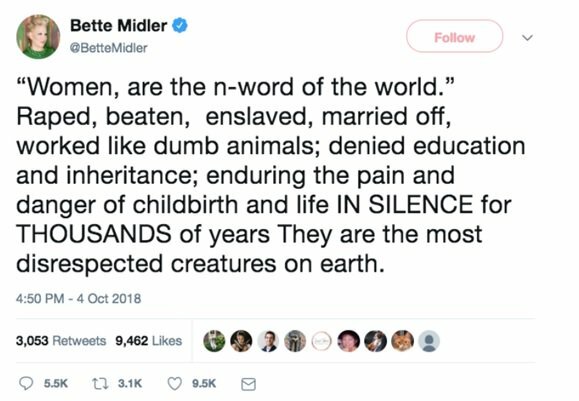 Midler was immediately called out for inserting black people into the conversation. This is the new identity of the left. Nothing must be discussed until the Democratic machine coordinates. This is the hive mind present on the left. They don’t know how to think for themselves. They don’t want to think for themselves. One would think the ordeal would wake up Midler to the issue. But of course it didn’t. She’s still a dedicated leftist. However, now she’s actively moved one small step toward authoritarianism.